In the custom car arena, there are few people as famous as George Barris, the American designer and just car builder. He gained popularity with his creations for TV and movies, building such iconic vehicular stars as the Munster Koach and the 1966 Batmobile. But his career and creations spanned more than just entertainment. He created commissioned vehicles, too, like this 1958 Chevrolet Corvette for Lee Sims of Accessories International, which is up for sale on eBay. The asking price is a steep $88,998. The custom Chevrolet Corvette, used for publicity for the company, barely looks like a Corvette. The nose design comes from Bill Mitchell’s XP 700 show car while the custom car also features a hood scoop, molded Buick taillights, and tail fins. Barris didn’t just add to the Corvette, either, he removed things, too such as the Corvette badge on the trunk and the factory twin-chrome strips. Interior modifications are few and far between. 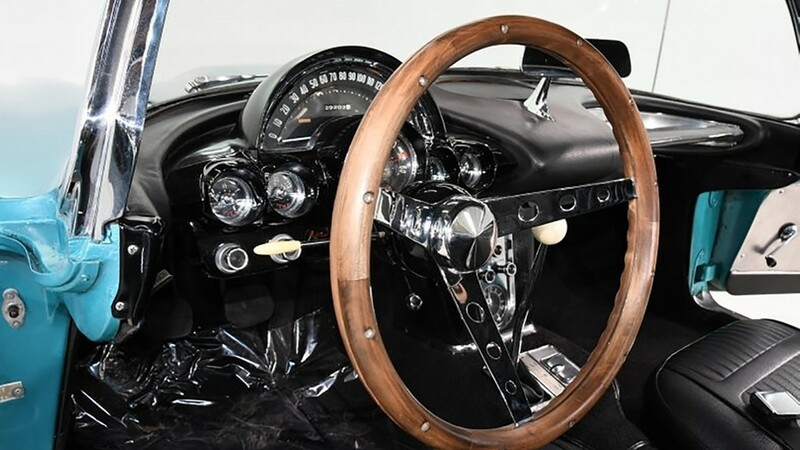 Barris added a walnut string wheel and Hurst shifter. About 25 years ago, someone restored the vehicle with Barris saying “Whoever restored the car looks like he did a nice job.” However, the car does have a few blemishes, which are expected after 50 years. At some point, a stereo was added where the factory unit would have gone. Someone also upgraded the engine from the original 283 cubic-inch engine with a 327-cubic-inch V8 from a 1964 Corvette. It makes 340 horsepowers, which routes through the vintage AAE mag style wheels with spinners and polyester whitewall tires. After its creation, and winning the Los Angeles Arena show in the early 1960s, the Chevy hit the show circuit. In the 1990s, after its restoration, the car hit the show circuit again. Whoever buys the custom Chevrolet Corvette get a white convertible top, removable hardtop, seat belts, pictures, and a magazine article on the vehicle.